While London is a great place to visit any time of the year, December is especially festive—as long as you can stand the cold. London can be chilly and damp in December, but visitors will be delighted by the city's elaborate holiday displays. One of the best highlights in December is the Hyde Park Winter Wonderland (November to January). Get a big fat festive fix at this annual event in Hyde Park, which gets bigger and better each year. Expect food stalls, authentic beer halls, fairground rides, Santa's grottos, and free-flowing mulled wine. Annual Christmas events include carol singing, grottos, fairs, pantomimes and colorful lights. Christmas Day is December 25. Boxing Day is the first weekday after Christmas Day (December 26 or 27). Read on for more information about what to expect during your December trip to London. Early in December, temperatures tend to fluctuate between 40 degrees Fahrenheit (4 degrees Celsius) and 49 degrees Fahrenheit (9 degrees Celsius). Later in the month, the temperature drops slightly and some mornings might see freezing temperatures. London skies in December are typically overcast—and don't expect much daylight. Usually, this time of the years sees just eight hours of daylight per day, but even less sunlight; you'll only see on average three hours of sun during this wintry month. There are generally are around nine rainy days, but snow is rare. Most of the rainfall is light to moderate, so you don't have to worry about a downpour spoiling your trip. Like most of Europe in the winter, pack warm sweaters, long-sleeved T-shirts, pants, and a coat. On warmer days, or for formal outings, a dress with tights can be warm enough for women. While it rarely snows in London in December, temperatures are cold enough to warrant packing gloves, a scarf, and sturdy boots or other waterproof shoes. Of course, it is London, which means an umbrella should be in your suitcase year-round! London is extremely festive in December and many events revolve around Christmas and other holidays. Whether you enjoy shopping or sporting, there's plenty to do. London Christmas Lights: From early November to early January, the annual Christmas light switch on is one of London's biggest festive events. The Oxford Street lights draw the biggest crowds as a celebrity usually flicks the switch. There are separate events for Regent Street, Covent Garden, Harrods and more. Trafalgar Square Christmas Tree Lighting Ceremony: This festive event is held the first Thursday in December. London is gifted a huge Christmas tree from Norway each year as a thank you for the country's services during WWII. The ceremony is usually accompanied by carol singing from the choir at the St-Martins-in-the-Fields church. The Great Christmas Pudding Race: Held in early December, this charity event that sees contestants complete a zany obstacle course while balancing a Christmas pudding on a plate. All while dressed as Santas, reindeer or elves, of course. Spitalfields Winter Festival (mid-December): This music festival brings opera, folk, classical and contemporary performances to quirky venues in and around Spitalfields in east London. London International Horse Show (mid-December): This annual event at Olympia attracts over 80,000 people a year and is one of the country's biggest equestrian festivals. 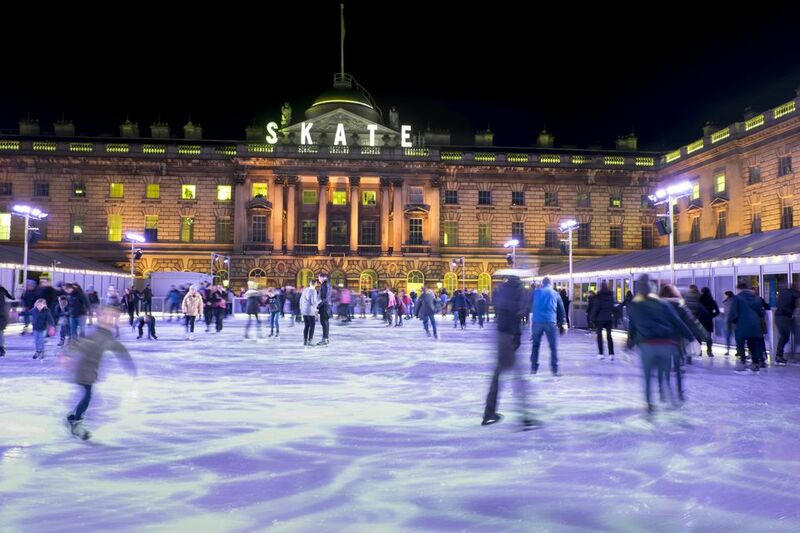 Wrap up warm, get your skates on and check out one of London's many ice rinks which set up shop at iconic venues including Somerset House, the Tower of London and the Natural History Museum. "January" Sales (from December 26): Snap up a bargain in the "January" sales, which technically start on Boxing Day. Harrods, John Lewis, and Liberty are always reliable options for post-Christmas bargains. New Year's Eve celebrations (December 31): Celebrate the arrival of the new year in style at one of London's many events. Download an app for a free tube map. London's underground system is the oldest in the world but is also one of the largest and most efficient. It's a great way to get around the sprawling city, but can be overwhelming. Downloading a free map of the system on your phone ensures that you'll be able to get where you need to go. Book hotel rooms and other travel arrangements early. While December leads up to London's low season for travel, the holidays are a popular time and will book up quickly so make your reservations well in advance. Wondering about the best time to visit London? Find our full guide to the city here.